It’s been five months since we moved into our new house and we have made a lot of progress. I haven’t done any reveal posts yet simply because I haven’t felt like any one room is really done. But then I realized — this is me! I will never think anything is done — so get on and show off what we have accomplished so far! The most “done” room at this point is our dining room. Let’s remember what it looked like when we bought the house. So there was a lot to do! Strip all the wallpaper and borders, paint the walls, remove chair rail and paint that, remove the mirrors and wooden shutters… the list goes on! The wallpaper was SO hard to get off in this room! It was really stuck on there. I made me seriously consider – could I live with this?? But alas – we got it all down! 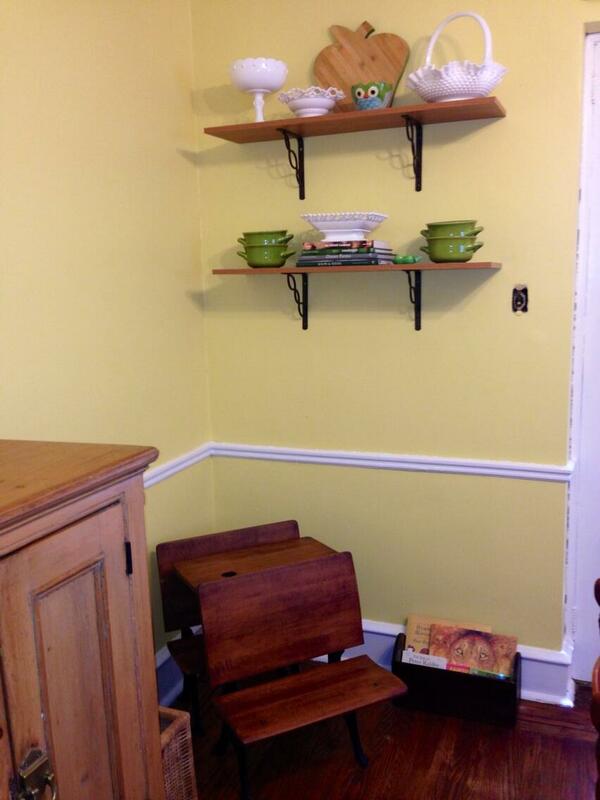 We painted the walls a pale yellow and the trim and chair rail a bright white. 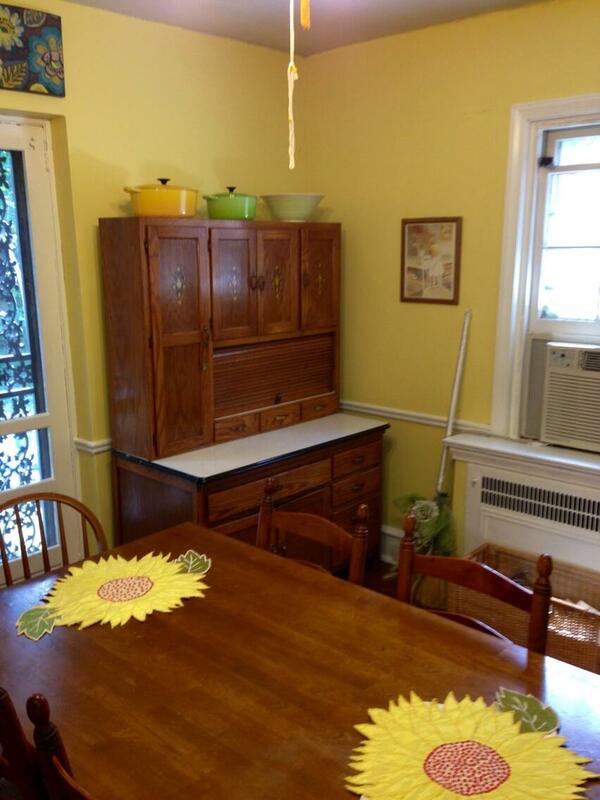 We removed the mirrors and the wooden storm doors. We actually kept the green on the butler door to the kitchen – not sure if it will stay forever – I am trying it out! We installed two wooden shelves to the left of the patio doors. Under the shelves is an antique wooden desk for Olivia (mine from my childhood.) The small wicker bin next to the ice box has all of her arts & crafts supplies for when she wants to draw at her desk. We also removed the wooden shutters off the window. 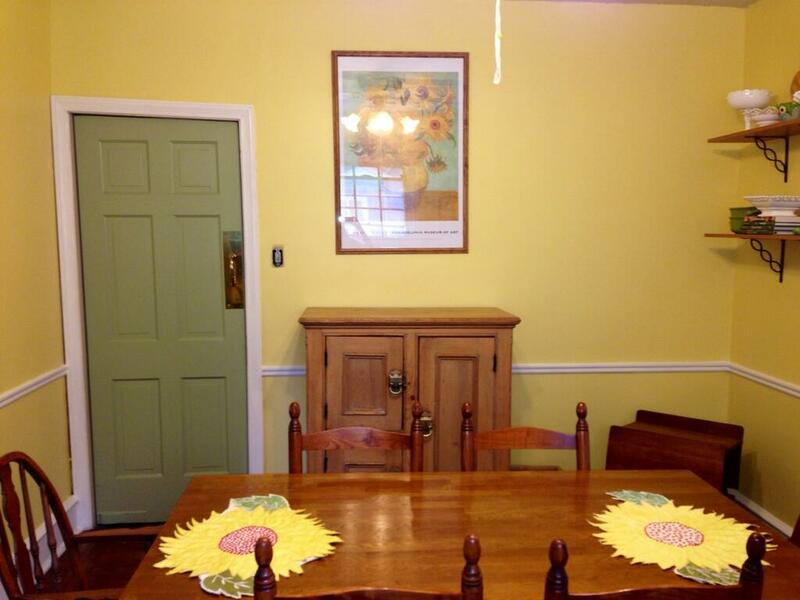 Still on the to-do list – hang the broom (the one Larry and I jumped at our wedding) over entrance to the living room. The big wicker basket under the window is filled with Olivia’s play food and toy kitchen items, because this is not a magazine shoot, I actually live here, and I have a toddler who has more stuff than you can even imagine! After living in our house for a few months, I realized that I was always using my laptop at the dining room table. It is a great place to spread out all of my things – whether bill paying, blogging, or doing things for work. I began to think that maybe I wanted my desk to be in the dining room. Then I remembered this old bookcase and thought – this will be great for all my cookbooks and the larger shelf in the middle can serve as a work station. So this is where I keep my laptop, magazines, and my home organizational binder. Everything is right at my finger tips and easy to move to the large table when I work. 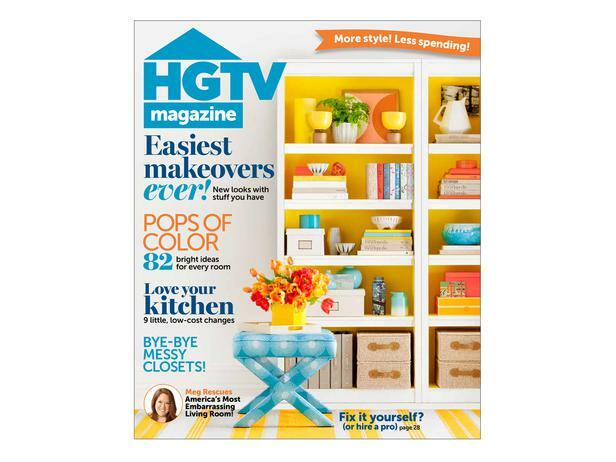 When I placed the bookcase in the corner, I immediately remembered the cover to one of my HGTV magazines. 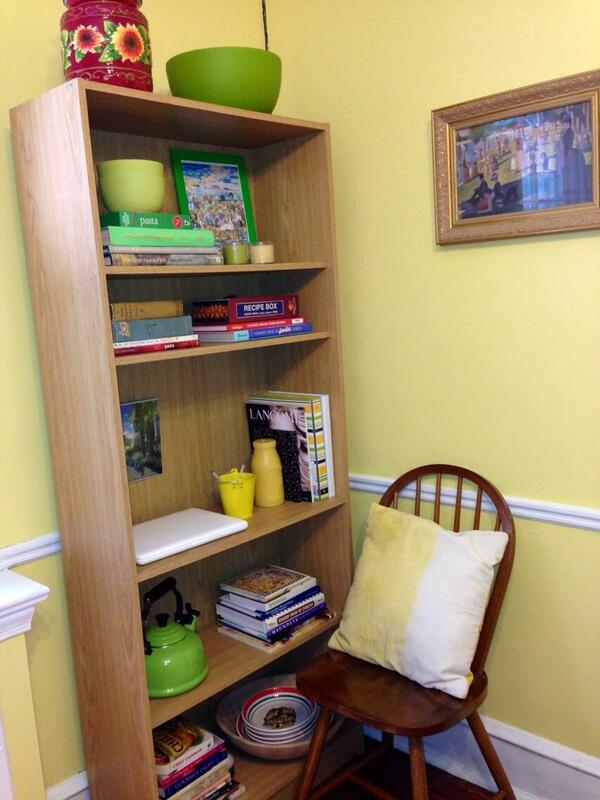 I think I want to redo this bookcase like this one. What do you think? What’s still left to do in this room? A curtain for the window (maybe a yellow gingham one I have from Olivia’s nursery), wall switch plates for the light switches (I saw beautiful ceramic ones at the Philadelphia Art Museum – but they were quite pricey), hang a few more pictures, with a few lower on the wall near Olivia’s desk so she can see some art at her eye level, and possibly redoing that bookcase. What do you think? This is my first “reveal” post so I hope you like it! Leave me a comment and let me know! Looks beautiful, Maureen! 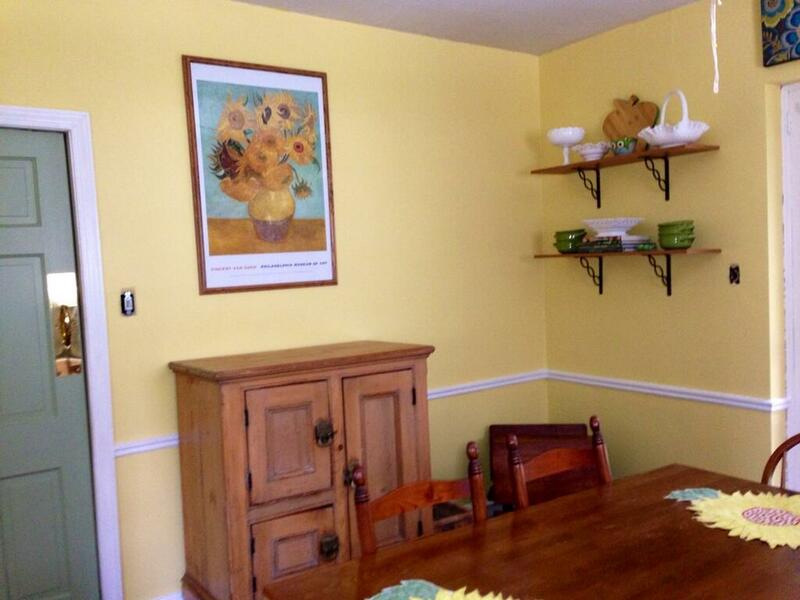 It’s amazing how much more open the space is with a nice, pale colored paint instead of intricate wall paper. I see your green accent color has made an appearance! Thanks Angela – I think the room looks so much bigger too. 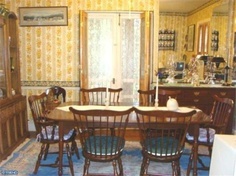 I also changed the direction of the table which makes more room on either side of the room. Nice work, Maureen! Looks fantastic! I love it! You did a great job. I love how you incorporated your style with things for Olivia, because like you said it isn’t a magazine shoot and you live there with a little girl who owns more than you. That is how Joe and I are now that we moved from a 3 story home into a 3 room apartment. It looks like Lainie’s toy store. I love the art you have hung already, especially the Seurat print-it’s my favorite 🙂 Can’t wait to see what else you accomplish! Thanks Maria! It is so true how much stuff kids have – and it never matches the decor at all! I try to find bins and baskets that at least blend with the room in order to hold all of Olivia’s stuff. You continue to amaze me with your talents. New job – interior designer. 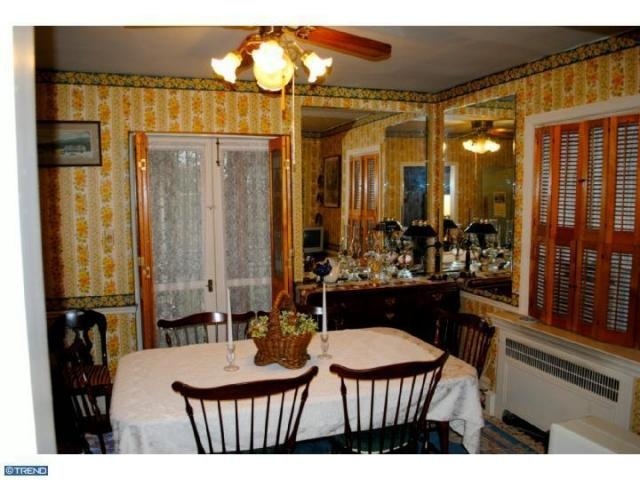 Love the dining room. I love everything about it! 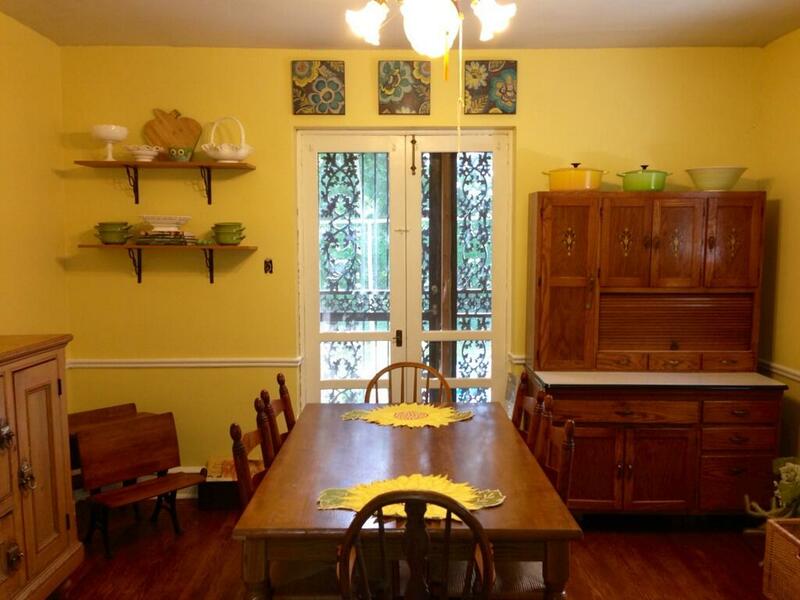 The color scheme, the butler door!, the french doors, open shelving, antique ice chest, everything! Looks fabulous. And I know what you mean, a room never feels finished…but that is the fun of it, right? Thanks Dana — I need your advice about redoing the bookcase! I wish I took one of your paint classes – but my work schedule never worked out for me to do it. And of course – no room EVER feels done!! yes, you should definitely paint it! what do you need to know? it’s a cheap ikea bookcase – with a cardboard back… i need to sand it down completely first right? excellent idea for the light switches!! I will look into this! Thanks Leigh! Maureen, what a great job! I do a lot with color, too, and I think the high gloss white is the key to making a room pop. 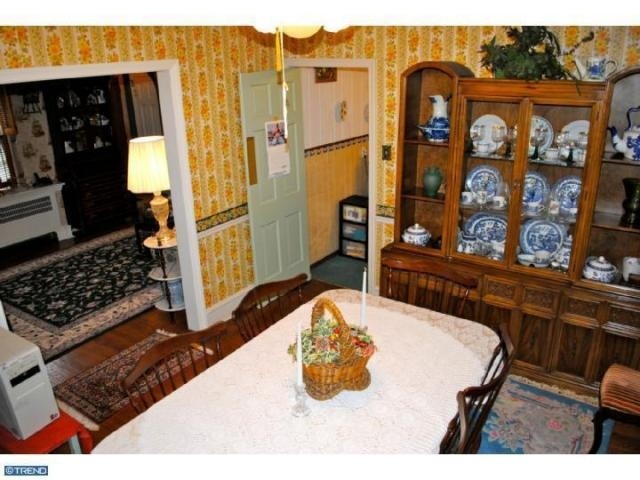 I think the hutch needs a big (fake?) ivy plant on top in a white basket. Then, you could do a few real ivy plants here and there to tie it all in together. I remember how beautiful your parents’ home was and I like how you’ve developed your own style! thanks Mrs Loeb!! an ivy in a white basket would be perfect… it would have to be fake because i have the opposite of a green thumb!!! Mom always had a beautiful home – I aspire to give Olivia the same – I was so lucky!!! Love seeing the pics of your kids on Facebook – Hannah is a perfect composite of you and Mr Loeb! We need a better word for “BEAUTIFUL” because it takes your breath away to see such lovely design and skill in making a room so alive!! !